Richard is a passionate director and occasional producer or actor. 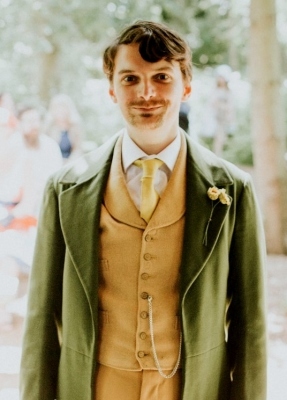 He graduated from Anglia Ruskin University with a degree in Drama, before working for four years as Assistant Producer of professional theatre company Cambridge Touring Theatre (CTT). Upon leaving CTT he set up his own theatre company, Twisted Willow Theatre, working for the National Trust and staging the innovative collaborative plays SEVEN WORDS FOR LOVE and BUTTERFLY EFFECT. SEVEN WORDS FOR LOVE was a sell-out success and BUTTERFLY EFFECT was critically acclaimed, garnering 4-star reviews from Cambridge Theatre Review and Varsity. For Cambridge writing group WRiTEON, Richard has artistic directed seasons of new writing, directed numerous plays and performed in script in hand readings. He also runs workshops called "Get it Write" to help writers develop their work. Richard joined the Bawds committee in 2017 and has been involved in two productions as a director. He directed Sean Baker's 2017 drama festival entry, ANYONE CAN DANCE starring James Inman and Lisa Wight. The play was highly successful, winning numerous awards and getting to the England Final of the All-England Theatre Challenge. In the other production Richard served as Assistant Director under Sean Baker for EMMA in 2017.